Women write genre books. Publishers publish those books. Readers read those books. So why are women still underrepresented in the adult SFF market? Why do they not feature on more recommended lists? Why does the community not discuss their books with as great a frequency and with the same enthusiasm as those authored by men? As a female SFF author, it’s a question that’s bugged me ever since my first book came out. It’s also a topic we’ve discussed in depth on Breaking the Glass Slipper, without really finding a satisfactory answer. I think the problem is manifold and there is collusion – often unknowing collusion – at all levels of the publishing industry. But it’s one level that specifically caught my attention: publisher-sponsored online advertising and PR. Over a year ago, I began to notice a gender disparity in SFF books promoted on Facebook and featured in newsletters. I just wasn’t seeing as many female writers as I was male, despite the fact they’re a key part of publisher lists. Knowing it could simply be down to perception, I signed up to the newsletters of several mainstream publishers and have been collecting them since April 2016. The results are in and, when it comes to the number of mentions, it’s all about the men. Not every publisher sends out regular newsletters. My findings are based on the number of communications I received between 5th April 2016 and the 6th April 2017. Hodderscape, for example, only sent 2 in a whole year, while Rebellion sent 25. I signed up to Tor.com in October 2016, so while they appear on the annual graph, the results are taken from the Oct 16 – Apr 17 graph. Additionally, Tor.com are an online publisher whose newsletters mostly feature articles and short fiction rather than novels. While I realise this skews the figures when compared to other physical publishers, I’ve included them because they provide an interesting counter-perspective to the general trend. My criteria for ‘featured’ is an image (either an author photo or a book jacket) and a clickable link to an interview or the aforementioned work. As you’ll see, Harper Voyager and Gollancz are the only publishers whose authors are all ‘featured’ which merely reflects a difference in newsletter style. Then you have a sliding scale. Rebellion’s parity was generally poor, as was Hodder, Gollancz and Voyager’s – though I received far fewer newsletters from them. Angry Robot achieved near parity between April – October 16, but for unknown reasons, the remainder of the year wasn’t as equal. Firstly that, as far as newsletters are concerned, men receive the lion’s share of the marketing. Does that point to a disparity across the entire PR spectrum? Possibly, but I make no wild guesses. Secondly, do these mentions translate into sales? It’s impossible to know, but it certainly brings an author and their work to a reader’s attention. Once on a reader’s radar, that author is far more likely to make a sale. Thirdly, if bloggers and reviewers in any way rely on newsletters as a way to discover authors, women are at a distinct disadvantage. Feminists are often accused of moaning about gender disparity without any evidence. I hope these statistics will elicit some debate about the way in which men and women are promoted by their publishers and what this might mean for their careers. And to those readers who take the moral high ground proclaiming that an author’s gender doesn’t matter to them – that would be commendable only if we lived in an equal world. Otherwise it’s burying your head in the sand. The first step is acknowledging gender disparity exists. The second – well, that’s where BtGS comes in. As well as exploring feminism and gender issues in SFF, we’re dedicated to introducing readers to authors and books they might not have encountered before. Come join the discussion. New episodes every other Thursday! How are you assigning gender for this study? I don’t see any categories that include nonbinary authors, and I know there have been nonbinary/genderqueer authors published on Tor.com. I had wondered this as well. We looked at the disparity between a binary male/female representation because with the time and resources available to us for this informal study, it was something we felt we could draw some conclusions (or at the very least observations) from. That is not to say that trans or non-binary representation isn’t an issue in this context but we are less equipped to look at that because we do not have data on the number of non-binary authors active with these publishers nor is the author’s gender status necessarily always indicated in the information we have available. 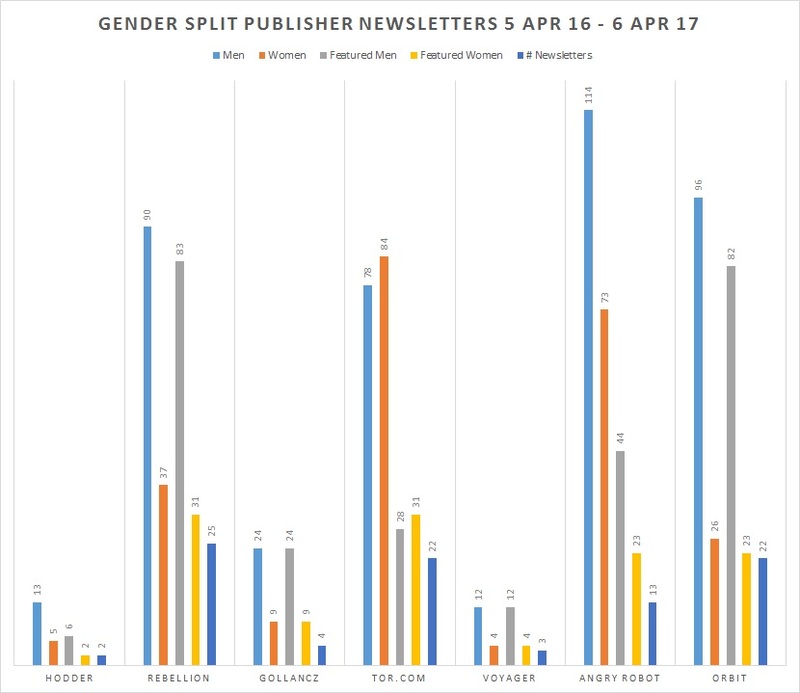 With the proportion of male and female approaching 50% respectively in demographics of readership, writership and publishing, the BtGS team did feel we were able to shed some useful light on the issue by contrasting their representation. Promoting awareness of underrepresented voices in the SFF and Horror world is something we strongly believe in. With that in mind, we have a responsibility not to claim to speak on behalf of such groups when we are not in possession of the facts and cannot engage in an informed debate that way. How did you select the imprints you chose to track? I note that many of the larger imprints, such as TorForge, Daw, Ace, etc., are not included in your survey. 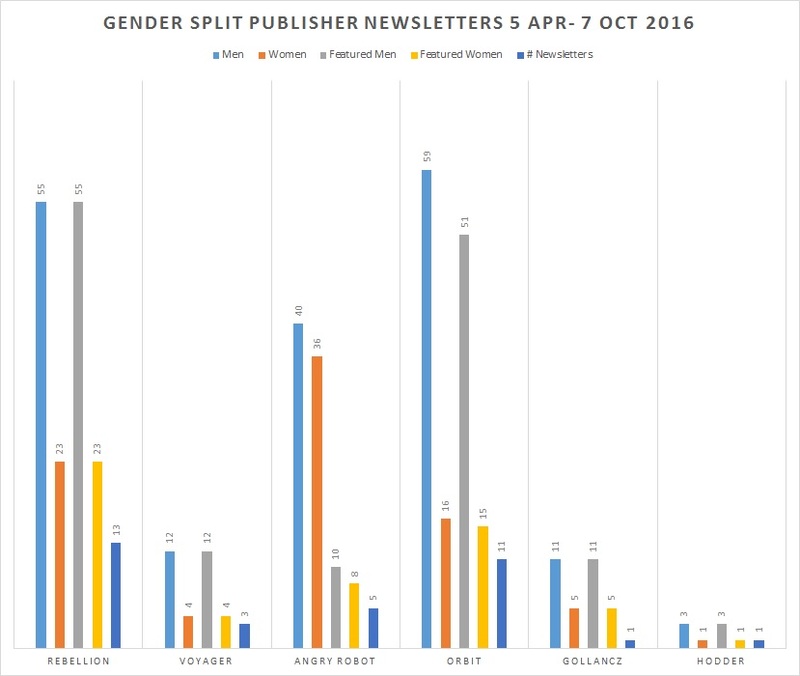 How did you control for each publishers’ balance of male to female authors? Your comments seem to assume that each imprint publishes as many works by female authors as male authors, but spends a disproportionate share of their marketing dollars promoting works by men. Could your numbers be driven by editorial decisions with regard to who should be published and when, rather than by marketing choices? How do you address different types of marketing strategies? For example, does a publisher’s newsletter cover all the imprint’s upcoming/recent releases, or only a subset? I’ve only included the newsletters of UK publishers, Tor.com being an exception as it’s classified chiefly as an online publisher. It’s very difficult to control for the ratio of male/female as it varies between publishers and many of the authors listed as being published by a certain publisher are not currently active, therefore would not feature by default. So really my data can only claim to speak for those who are producing books now. Another variable is the time frame of newsletters – some only promote the newest works i.e. upcoming or published in the last few months, while others like Rebellion give weight to their backlist titles. The quality and depth of newsletters varied greatly. Some contained a good deal of information and featured a dozen authors, while others were sparse. Unfortunately, I could only work with what’s available. Yes, editorial decisions could well affect my numbers. In fact it may account for the parity difference visible in Angry Robot’s figures. And indeed marketing strategies are different, but does that change the fact that the great majority of the work offered to me as a prospective reader was authored by men? Those figures cover a year and many book releases. Even if there were a lean few months where a publisher only published men due to editorial decisions, it would surely balance out over the following months where the weight would shift to their female list? I think the only time we see that happening is in Angry Robot’s numbers. 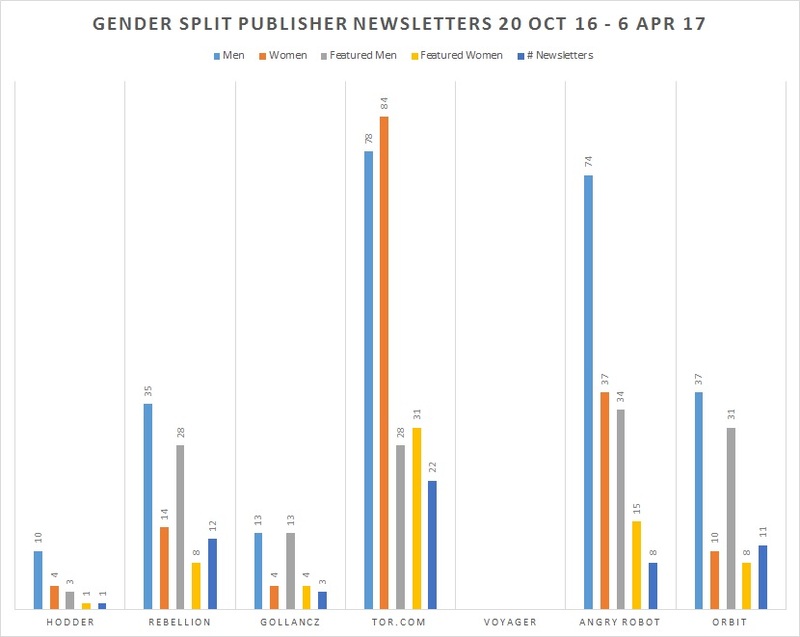 Still, one could argue that, despite the variables, publishers have a responsibility to feature an equal number of male/female authors in every media communication they release. Not the cleanest data to handle by any stretch. It might benefit from a further year’s study and adding in the overall ratio of men/women published by a certain publisher (if I can source accurate numbers) and also split into publishing ‘windows’, i.e. spring-summer / autumn-winter.